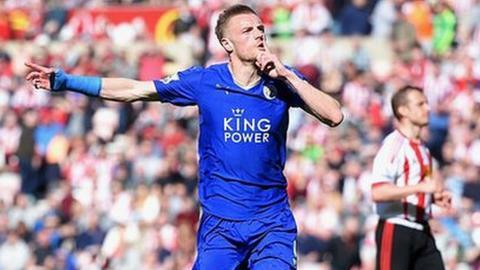 Claudio Ranieri said "the fans can dream" but his Leicester players must not get carried away after edging closer to the Premier League title with a 2-0 win at Sunderland. The Italian was visibly moved as he celebrated a result that leaves the Foxes needing three wins for the title. "You make this job for the emotion you feel inside but it is difficult for me to tell you what kind," Ranieri said. "The fans must continue to dream but we must be concentrated and focused." Speaking to BBC Sport, the Leicester manager added: "We have to stay calm, be focused, strong, solid and keep going. Today we made some mistakes. We still have to look at what is not right." Leicester remain top of the table and clinched Champions League football next season after Tottenham beat fifth-placed Manchester United 3-0 at White Hart Lane. Leicester, who this time last season were fighting relegation from England's top flight, are seven points ahead of second-placed Tottenham. Ranieri's table-toppers face West Ham, Swansea, Manchester United, Everton and Chelsea in their final five matches.